Dave Kleh is proof that you never really know what's going on inside someone's head — until they make a record. You probably wouldn't expect your real estate agent to create slaphappy music with lyrics that sound like the insane rantings of a burnt-out kook. But Kleh, who works for Keller Williams Realty by day, builds his music career upon unexpected whimsy. Laugh: A Collection of Drinking Songs From the 802 fortunately manages to go beyond the realm of curious novelty to a place worthy of careful consideration. If your dad was a super-hip musician type in the '70s and '80s, he probably listened to stuff like Violent Femmes, Frank Zappa and Talking Heads. This is likely what Kleh was listening to back then, as well as today. Inspiration from the freakiest New Wave and post-punk is built into Laugh's architecture, with mostly delightful results. "Laugh," the opening track, offers plenty of reasons not to take Kleh too seriously. The track opens with boisterous, forced laughter recorded so incredibly close to the microphone that it may turn off some listeners immediately. Those with a little more patience will be pleasantly surprised by the satirical conversation that follows. "Tell me you'll clean up the water / and I'll vote for you," Kleh declares, singing from the point of view of the naïve, easily swayed voter who wants nothing more than to hear his candidate regurgitate his own views. It's the kind of misguided discussion you might overhear during election season as townies toss back a few at the local watering hole. Further down the rabbit hole is "Two Splashed People." (We've now entered the stage of drunkenness where one becomes easily distracted.) Somewhere between ska and klezmer, the song goes ultra-bonkers when glockenspiel-like riffs on "Mary Had a Little Lamb" and the Beatles' "Ob-La-Di, Ob-La-Da" take the lead. The album comes to a close the same way a night of heavy drinking does: sloppily. The self-explanatory foot-tapper "I've Fallen Down and I Can't Get Up" leads into the slurring and repetitive "Men Were Born in the Bottom of a Beer Barrel." On the latter, strange, overdriven electronic sounds cushion Kleh's lyrics, and, like any drunk who can't stop repeating himself, Kleh's night of laughs and drafts gets dragged out a bit too long. Laugh probably isn't something you'd throw on at a party, nor is it something to listen to for quiet introspection. The best time to listen would be when you want to shake up your routine and see the world through the eyes of a truly awesome weirdo. Or, you know, maybe the next time you want to get blasted. 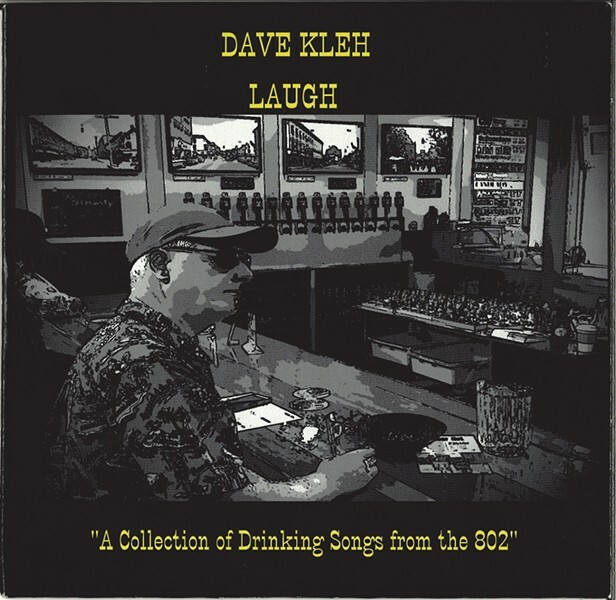 Laugh by Dave Kleh available at cdbaby.com/artist/davekleh.